Most people should know that Corgis herd cattle. Those humans who share their house with a Corgi know that we will herd anything. If they even hint at a walk a good Corgi will have them herded out of the house before they can have second thoughts. It takes real skill to be able to herd politicians. They are even more self-centred and difficult to herd than cats. Sutter Brown, who died last week, was a dog who showed a lot of style in his job of herding the politicians of California. Sutter was the dog of Governor Jerry Brown and Anne Gust Brown. Sutter may not have made all the decisions or worried too much about the detail but he would have brought a constructive happier atmosphere to difficult work. 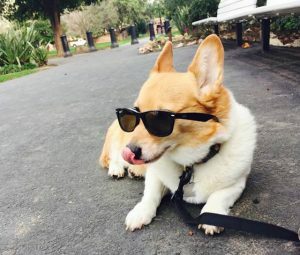 Like all good Californian Corgis, Sutter was fond of dark sunglasses and looking cool. Obviously, he thought he looked cooler when sharing lunch with one of his owner’s staff or even a republican politician. Sutter was very bipartisan in his search for treats. He was very happy and very good at generating goodwill between the democrats and republicans of California and has told his sister, Colusa Brown, that some republican senators are a particularly good sources of treats . Sutter died of cancer. This disease affects a surprising number of dogs. Dogs do not tell their owners that they are sick. The owners need to regularly check their dogs and if they find a lump they should bring the dog to the vet sooner rather than later. Sutter is survived by the state of California and the Corgis of Wales and beyond.